Summary Feature poor AC1900 class router built by ASUS and powered by a Google OS. 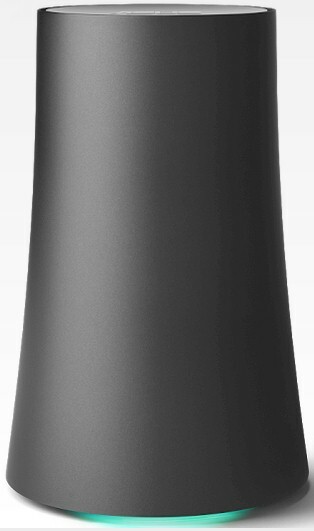 When Google sent another TP-LINK OnHub for retest, it also sent a brand-new ASUS SRT-AC1900 OnHub. ASUS' take on the OnHub starting shipping at the end of October, trailing the TP-LINK version to market by a few months. The image below shows the two OnHubs side-by-side. The two look like they could nestle snugly together with their almost mirror-image styling, but their inverse curves would prevent that. Key differences are shown in the spec table excerpt below. One difference not noted: TP-LINK's outer shell is removable, while the ASUS's is not. Port complement is the same for both OnHubs: one Gigabit Ethernet WAN; one Gigabit Ethernet LAN; and one USB 3.0. The USB port remains non-functional, as does the ZigBee (802.15.4) radio. I learned my lesson on the TP-LINK OnHub and didn't attempt a complete disassembly of the ASUS. But I was able to get it partially disassembled fairly easily, thanks to the use of screws vs. hidden plastic locking tabs (thanks, ASUS!) Removing the bottom cover reveals the first difference: the ASUS' speaker is bottom mounted. The TP-LINK's sits on top. Removing a few more screws allowed me to slip off the outer shell. The view below shows two different angles. Removing the antenna ring,then a partial inner shell reveals the view below. The main assembly has a processor board (left) and RF board (right) attached to an aluminum frame, with heatsinks atop the RF cans covering pretty much all components on each board. That's the dual-band monitor radio antenna at bottom left and the ZigBee antenna above it. The Bluetooth 4.0 radio is peeking out from the rear, behind the RF board. The single tri-color LED is the small white square at the bottom of the board assembly. The left side view affords a better view of the processor board heatsink. The right side view shows the RF board with its heatsink. The Bluetooth antenna is mounted to the plastic frame in the right-side photo area where the heatsink fins are cut back.